Original Gilt ‘Lance’ Hands in Superb Restored Condition. A highly unusual and very attractive Rolex Oyster Perpetual, model 6084, with a super cool matt Blue dial, and ‘Thunderbird’ bezel. At 34mm diameter, excluding the crown, this is a good sized watch by 1950s standards. One other feature which makes this watch even more special is that it retains its original ‘Super Oyster’ crown – more details to follow. The Rolex Calibre A260, 24 Jewel Chronometer grade movement is very accurate and reliable even by current day standards. This movement has just been fully overhauled and serviced and is in sparkling condition. This beautifully elegant, classic early ’50s Rolex matt Blue dial is furnished with ‘Pencil’ indices, matched by original, restored ‘Lance’ hands. The hour indices are complemented by the markings on the ‘Thunderbird’ bezel which adds interest to the dial and gives the watch an overall, slightly nautical look. The highly unusual super cool matt Blue dial has been matched with a Navy Blue Crocodile strap which we feel looks fabulous. We love the elegance and symmetry of early Rolex Oyster Perpetual dials and we feel that unless one absolutely ‘has to have’ a date function, the early non-date Rolex Oyster Perpetual dials are so much better looking. Here, less is definitely more. This is the original dial which has been restored to the highest standards by our dial restorers, considered to be the best in the UK. The 14ct yellow gold watch case is in excellent condition and measures 34mm, excluding the original signed ‘Rolex Super Oyster’ crown. Please see image number 9 for a closer look. The ‘Super Oyster’ crown was introduced for a short period during 1951-1954. It has additional seals, making the screw-down crown unnecessary. This design was developed as an alternative water-resistant design to the screw-down crown which Rolex first introduced with its Rolex Cushion in 1926. However, for a variety of reasons, Rolex decided to withdraw the ‘Super Oyster’ Crown in late 1953 – early 1954. Many watches with ‘Super Oyster’ crowns were later replaced with screw-down crowns, during servicing by Rolex. Therefore, examples retaining this ‘Super Oyster’ crown have become quite rare. The ‘Super Oyster’ crown acts in the same way as a standard crown and can be wound from the normal position. The Thunderbird bezel became popular during the early ’50s and so is characteristic of Oyster Perpetual watches of this period. We feel it increases the size of the dial somewhat and adds interest to the watch. The case-back on this watch is often referred to as a Semi-Bubbleback because it is deep, but not quite as deep and rounded as a full Bubbleback. The case has been professionally cleaned, carefully inspected and lightly polished and is in excellent condition with no scratches, dings or other damage, visible to the naked eye. Inside the case-back, all the markings are correct and as expected, with the Rolex signature; ‘Montres Rolex SA Geneva Switzerland’, and two Rolex model reference numbers, 6084 and 6085, making this a transition case. The case also carries Geneva Swiss 14ct hallmarks. Please note – even though this watch was specified as waterproof when new, and the rubber seals have been replaced on the case-back and crown, the water resistance of this watch has not been tested and it is not guaranteed. The original high grade “Officially Certified Chronometer” Rolex Calibre A260, 24 Jewels movement is highly regarded for being especially accurate, reliable and strong. It was in fact, also used in the early Rolex Submariner. However, this example is rare because it is beryllium-copper plated in the same way that almost all Omega movements are produced. This is interesting because a great many of these early 1950s, Rolex Oyster Perpetual Bubblebacks, have passed through our hands during the last 10 years, but we have never seen one with a beryllium-copper plated movement. Perhaps, a little like the Rolex ‘Super Oyster’ crown, this was something Rolex experimented with for a short while, and then decided against continuing with. It is also interesting that the movement states: “17 Jewels in Chronometer, 7 Jewels in Rotor”, making 24 Jewels in total. This movement is in very clean condition and working perfectly following a thorough overhaul and service by our vintage Rolex specialist watchmaker. This involves dismantling the watch to all its component parts, careful inspection under high magnification, replacement where necessary with only genuine Rolex parts, then careful reassembly and adjustment before testing and calibration in 5 positions. The watch now winds, sets and runs accurately and reliably and after final calibration, the movement is running strongly and accurately within +8 seconds/day. This is outstanding for a watch movement of this age! We have confirmed this timing on our electronic Timegrapher. The power reserve of this watch is 41 hours. This watch movement is now ready for many more years of faithful service and is perfectly suited for everyday use. We are pleased to offer this with 12 months’ warranty on the movement*. The watch is fitted with a new high quality, Navy Blue Crocodile strap and Rolex gold plated buckle. We feel this matches the watch perfectly, however, please note, if a different style or colour of strap is preferred, please let us know and we will do our best to oblige, free of charge. We carry tan, conker, dark brown burgundy and brown in stock, in plain padded leather, alligator, crocodile skin or lizard skin. Although there are no original papers with this watch, the reference numbers, markings, signatures and hallmarks are all correct, dating the watch to circa 1952. Detailed particulars will be included with the receipt, along with our 12 months’ warranty*. A separate insurance valuation for the replacement value will be provided at the time of sale with our ‘Lifetime Authenticity Guarantee’ which states: “If this watch proves to be anything less than totally authentic, or not as described, Vintage Gold Watches of London will offer you a full refund at any time”. The watch also comes complete with Rolex Oyster Inner and Outer presentation boxes as shown. This is a truly top class example, from the worlds now most famous luxury brand, of a 1952 vintage gold Rolex Oyster Perpetual in wonderful condition. This watch is ready to wear, use, treasure and enjoy. It is totally practical for everyday use and if treated with reasonable care, it will make an excellent investment and a family heirloom piece. Even though vintage gold Rolex watch values have risen markedly in recent years, we still feel certain great examples such as this, remain undervalued. 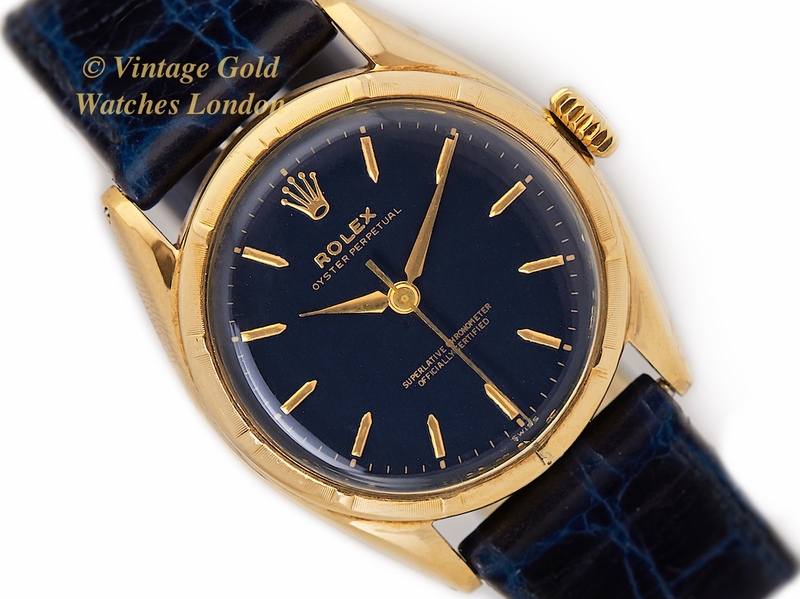 This is because, as the years go by, the world market for vintage gold Rolex watches is expanding almost exponentially, and so we feel sure prices are destined to climb ever higher during the foreseeable future. A word regarding our prices: We always try our hardest to acquire the very highest quality watches available, before restoring these to the highest possible standards. We then offer these at the fairest prices we can, taking into account our pre and post sales, care and service. This approach means we will never be the cheapest, but nor will we be the most expensive. Indeed there are some well-known stores in West London which are highly successful charging between two to three times the price you see here. We therefore consider our prices to be fair, given the quality of watches we have to offer. We are happy for you to pay by PayPal as this is the quickest method of payment. However, if you would like to pay by UK bank transfer we will be pleased to assist you with this and pass on a 3% saving to you. Similarly, if you wish to pay by International SWIFT or Bank Wire Transfer we will provide you with our BIC / Swift number and our IBAN number. We will, of course, accept your cheque if you will allow us a few days to clear it.